What is the Difference Between Red and White Wine Glasses? Avid wine consumers are often very particular about the types of glasses that they use to imbibe different varieties of wine. By using differently shaped glasses, they can pinpoint certain aspects of the wine’s flavor and bouquet, along with directing the wine’s path to different parts of the mouth to enhance the full tasting experience. The great glass separation is most commonly enforced between red and white wines, but sparkling wines, rosé wines, and dessert or port wines all are best enjoyed in unique glasses as well. In this article, we’ll explore the shape and style qualities that create the difference between red and white wine glasses. When people talk about the construction of wine glasses, they're really talking about four constituent parts: the base, the stem, the bowl and the rim. The base, or foot, keeps the glass upright; the stem allows the gripper to grip the wine without warming the liquid; the bowl helps capture the wine’s aroma, distribute the flavor to a certain part of the mouth, and assist the wine in retaining its singular qualities; and the rim provides the final barrier between the wine and your lips. When differences in wine glasses are considered, the two parts of the glass that are most frequently adjusted are the stem and the bowl. The stem, of course, is not present on a stemless wine glass. These stemless glasses are sturdier, less easy to accidentally break while washing, and simpler to handle for novice wine drinkers. The shape and make of the bowl, on the other hand, is the primary difference between red and white wine glasses and will be the primary focus of this examination. Why are red wine glasses bigger? When a wine drinker asks a sommelier, “Which wine glass do you use for this vintage?”, a variety of factors are taken into consideration. The wine expert must consider the style of grape that was used to make the wine, the temperature that the wine is meant to be served at, and the consistency of the liquid, among other things. Basically, red wine glasses are traditionally taller and have a bowl that is wider and more tapered, whereas white wine glasses are narrower and have a smaller, U-shaped bowl. Because most red wines are made from grapes that retain their skins through part of the fermentation process, their flavors are more complex and they generally require more aeration before consumption. The shape of the traditional red wine glass helps accomplish these goals: the wide, tapered bowl lets the flavor expand while trapping the scent in the glass, and the wide rim exposes the wine to a greater volume of air due to its impressive surface area. Red wine glass shape can also vary depending on what region the wine is from: Bordeaux and Burgundy glasses are among the varieties that are explored in this instructional video from Expert Village. As stated earlier, the main difference between red and white wine glasses is the shape of the bowl and the height of the glass. White wines are usually less complex than reds, and they are supposed to be served cold, rather than at room temperature like a classic red. Therefore, white wine glasses should have a stem, so that warm hands do not heat the wine, and a bowl with a smaller surface area so the wine can keep its temperature and retain its delicate flavor notes. Other glasses for white and sparkling wines are even thinner in stature. Champagne flutes are so narrow at the top that they barely taper at all and are almost the same width throughout the entire glass. This construction oddity is due to the fact that champagne and all sparkling wines are carbonated. The narrower bowl helps retain the carbon dioxide bubbles that were created during fermentation and keep them from being exposed to too much oxygen. 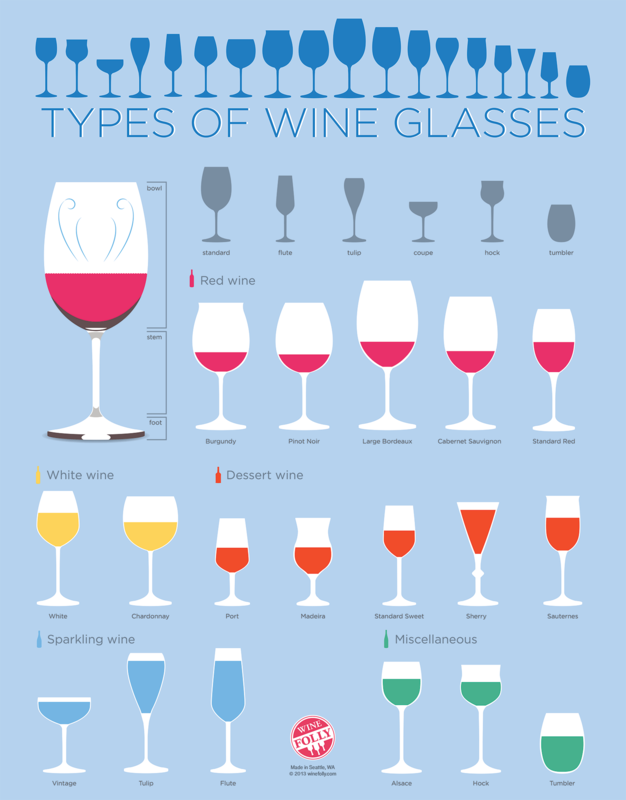 The basic differences between stemmed red and white wine glasses apply to their stemless counterparts as well. Red wine stemless glasses have larger bowls to provide for aeration and flavor expansion, whereas white wine stemless glasses are narrower and more upright. Although both red and white wine can satisfactorily be consumed using stemless glasses, chilled white wines will warm up much more quickly in stemless glasses thanks to direct contact with the hand. Although there are certainly skeptics that do not believe the shape of the glass has any bearing on the taste of the wine, the industry is largely in agreement about the utility of using different wine glasses for different types. Discerning the difference between red and white wine glasses is only the beginning for many committed hobbyists. Once you start down the rabbit hole, there are so many unique and interesting arguments for choosing particular glasses over other similar models. Winefolly has an excellent infographic that examines the world’s many varieties of drinking vessel, from flutes and tulips to coupes and hocks. At the end of the day, the choice is yours. Many wine drinkers simply purchase a set of all-purpose glasses and a set of champagne flutes, either because of cost considerations or absolute indifference. As an assistant D.A. in a small city, Tim Packard always drank whiskey whenever he was out to dinner with clients, until an Italian mobster introduced him to a classic Valpolicella. One mouthful of the latest vintage, round with the flavor of cherries and earth, and he never again allowed friends to order the second-best wine. Take your cocktail making skills to the next level! Sign up for our newsletter and get our cocktail recipe eBook for free! What is the Best Temperature for Red Wine? Copyright text 2016 by Drinxville.